Having lost his bid for sole control of the Gate of Ara, Lucifer took his forces and pressed on to Earth I. He knew he must have access to Earth II, if he was retain credibility with his supporters and slaves. What if he failed again? Would not his top commanders think they could do his job better and mutiny against him, even as he had done against the Most High God. He had to crush such a possibility in the bud, he knew. Repeated failure and weakness was no way to run a campaign. His words could only do so much. ; his superior force, however great, was not sufficient to keep every angel and demon in check without their consent, if his army should be thinking of a change of leadership. No! He must gain access to Earth II and demonstrate he was still the greatest opposing player in the game, outside of the Enemy, of course. “Commander” Michael and his forces must be thoroughly humbled, in fact, doubly for the stinging rebuff Lucifer had lately received from his hands at the Gate of Ara. It stung all the more because Michael had been his subordinate at one time, before he, Lucifer, had made the great discovery of finding the Godhead within himself, a wonderful discovery that he immediately shared with everyone, convincing quite a number to look to him as the rightful Deity. There was one great consolation. Michael hadn’t succeeded in stopping him from slipping through Uran’s net, thus gaining him access to Universe I in the bargain along with Earth I. Now he could do what he pleased with an entire Universe, and would make Michael and the Chief Enemy pay dearly for the trouble they caused him at Ara! But first priority was to secure the Twin Earths’ Bridge! Though a wide window of his palace set on a moon of Jupiter with icy seas of perpetually frozen sulphur, Lucifer looked out at Earth. He had no trouble seeing it, since his gaze was so far-ranging he could pick out any object in space he wanted and examine its every feature. “What do we do with our friends the Titans?” he was queried by a chief aide. The Light-Bringer of old (though he was considerably dimmer at this stage) sat in majesty on his golden throne (it wasn’t heaven’s gold, of course, but something that, though opaque and dense, looked enough like it), pleased with his strategy and how well it was going. Hard-pressed, the relatively few defenders of Earth I, which had been originally intended by the enemy to detain him indefinitely, were being pushed into the sea! The Titans, not faring so well, were going under that very water in the West of the planet. The Enemy was pursuing, evidently, a total work of destruction and the continent was breaking up. “A pity!” Lucifer sighed. “They were going the same way as Mukalia had gone before them—-straight to the bottom of the sea and the bottom of the Enemy’s dungeon in the Underworld!” But he could build another on its ruins. What he really needed was to secure the Bridge. Aides rushed into the throne room, then scraped and bowed all the way to the throne when he nodded for them to approach his angelic majesty. “We have secured the Bridge, Your Divine Majesty!” a general informed him with great exultation. Lucifer did not hesitate another moment. He leaped up from his throne, and flew directly to the bridge. Let the others catch up when they could, he thought. Nobody could stop him now. The Bridge rose up from the middle part of a southern continent. In a moment’s space of time he was flying past the fiercely embattled guards and through it. A few moments later he was standing on Earth II! “I have returned!” he exulted, viewing a planet that looked much the same as the one he had just left, with a Titanic Atlantis undergoing the same judgment of utter destruction. He waited a few moments as his forces broke through least resistance at the gate on the other side and poured after their master and reached him. “I want the planet secured with a strong detachment, and this bridge must be held at all costs, at each end, do you understand?” he declared to his commanders. Without delay they flew to deliver their orders to the subcommanders, and the bridge and planet were secured as their supreme commander had just directed. Soon Lucifer sat upon a golden throne overlooking Earth II and the Bridge of the Titans. It was a beautiful view. He had great plans for redefining Earth and setting up new and glorious civilizations on the ruins of Mukalia and Atlantis, his last two dominions. Now that the Earths were both in his hands securely, he did not fear a repeat of the past, when the Enemy held full sway over the Twins. Unable to restrain himself, Lucifer ordered a division of his forces, some to hold the two planets, the others to fan out and begin the destruction of much of both Universes—-merely from spite, a scorched earth policy because he knew he couldn’t hold both Universes anyway against Michael’s superior numbers. He wanted Michael to feel what he had felt, when first thrust out of heaven and then away from the Gate of Ara so rudely. He still would make an attempt at Ara, when he had drawn Michael’s attention away sufficient to attack Uran alone. He flew back across the Bridge, but at the end he met a wall of fire moving across it, consuming the crystal. Lucifer had never seen anything like it. Where did Michael get such a weapon? It looked like it poured forth from the mouth of the Lake of Fire itself! He halted, his mind racing among his myriad of possible options. Then he saw his “victory” over Michael was a brief, hollow one. At all cost he must get back to Earth I, or lose it forever. As for Earth II? He turned and saw a wall of fire coming from that end as well! Why had he divided his forces, which was against his own military thinking? In the joy of his victory, he had overstepped! But it was too late, he realized, to reverse the situation. He must make the best of what remained—-if anything remained, that is! Let the Star-Stones have Earth II to play with, he decided. At the least He wanted Earth I and Universe I, with the single exit at the Gate of Ara that opened to the Third Heaven. Without that gate he would be confined to the conditions of the agreement he had made with the Enemy, which he had been forced to accept in order to gain his freedom from the Pit. Flying with all his archangelic might, shielding his face, Lucifer flew at the river of living fire. Screaming, he tumbled this way and that as he felt the scorching, searing flames engulf him, but he kept flying. It was unspeakable-—a deadly fire even hell did not know, that was straight from the Lake of Fire! After what seemed an eternity of excruciating pain, he burst through the other side. Loyalist guards stared at the commanding fallen archangel, as Lucifer rolled over and over in the mud and water of the great lake by the Bridge to snuff the flames consuming his body. A boiling column of steam erupted from the water and rose high into the sky. The fire at last out, skin gone, the shell of his spirit blackened beyond repair, Lucifer emerged from the lake, staggering and gasping from pain and shock but more enraged in his spirit than ever before. He caught a glimpse of himself in the lake once the waters quieted. Horrors! What was that he saw? All his beauty, all his loveliness-—all gone? Michael said nothing and simply gazed at the ranting archangel. Instead, Lucifer turned when Michael looked toward the Bridge, following his gaze, and saw there was nothing there at all. The Bridge that soared into space, connecting two worlds, was gone! Something so mighty and vast? It couldn’t be, but it was! Only the stubs remained, where it had sprung from great anchors in the earth’s crust. “You’ll regret this,” the prince of the powers of the air shouted as best his scorched voice could shout to a being who had no reason to regret anything. Remembering his dignity, he stopped shouting and then, wrapping his tattered remnants of glory around himself, flew off to his throne room to decide what to do next. When his aides returned from their forays into Universe I, he was a little gratified to hear what havoc they had wreaked in such a beautiful garden of worlds and stars. How sweet vengeance was! Lucifer, despite his terrible burns and rout at the Bridge, was feeling better already. His army, despite the latest disaster, also revived in its spirits. Lucifer saw that there would be no mutiny after all. What choice did his followers have anyway? Michael had shown his latest new weapon—-the Fiery Wall from the Lake of Fire-—and against that who had the slightest chance? Not even Lucifer’s choice of weapons, fiery darts, could penetrate it! No, it was best to hold to what they had, without bringing the Fiery Wall once again upon them! When Michael made no further attacks, showing no sign of contesting Lucifer’s Jupiteran throne, Lucifer resumed plotting how he might take Ara. Lucifer almost bit his tongue off. What? Another Enemy redoubt? He had lost Earth II with its Universe and been stripped of his unsurpassed beauty, and now this? He had to go and look for himself. He decided he needed space to come up with a suitable strategy. So, in a strategic retreat, he returned to his throne, to meditate and devise something that might work. In the meantime, he noticed something also rather strange on the planet’s surface. The garden that he had penetrated, stopping the Enemy’s plan to take over the planet with a new species, well, the gate had been removed, and the garden was open to all comers. Also, the new species that the Enemy had created and who were now under Lucifer’s rule—well, some of them were resisting his rule successfully. He saw that if these grew too great in numbers he might lose possession and control of the entire planet. Obviously, he must lay aside Ara and Orion for the time being and concentrate more on internal affairs on Earth. Disappointed and a big angry to be taken from larger, more important concerns, Lucifer turned his full attention on “mankind.” He had thought all was fine, all was under his control, but now there were signs that it wasn’t true. Some were spreading report of a coming “Seed of Woman” who would set the people free of his control and also render them immortal again! What on earth was that? Everyone knew that the male of the species produced the seed that spawned more individuals of this race! It was an impossibility, yet the tale kept cropping up, and gaining new adherents, who used it to resist his own souvereignty over them. That was something he could not tolerate! He went himself to the garden. But though he ransacked it, tearing and burning all the way through it, he could not find the Tree he sought. The tree of the knowledge of good and evil, well, it was flourishing right where it had always been! As pretty as ever, it was drawing, evidently, a great deal of attention, and had become a popular shrine. What fools humans were! People were coming to dance and do naughty things beneath its branches as if that would gain them divine favor! That was all very well with Lucifer, always eager to embarrass the Enemy in any way he could. Let the tree remain free to all to eat of! Lucifer thought. It had done him a good turn, and could still be of use in keeping the humans under his power. Turning to the other problem, the spread of “godly, God-fearing” people who wanted nothing to do with the tree of the knowledge of good and evil and its rites, he went to try and stop every last one of them if he could. Here he found the Enemy’s chief resistance, however. He had free rein to move about the planet, but when it came to killing the few “God-fearers” he found them hedged about with Michael’s angels, and his burning darts were always deflected by their shields. Or was it their shields only? Apparently, the ones he had most cause to destroy used an invisible weapon against him, for when he threw his darts at them, they sent them flying right back at him! How? He sought the reason and finally discovered that they were quoting the Enemy’s words to themselves, memorizing them, and then holding them in an arsenal until needed. When needed, they drew them out and use them to not only ward off his attacks but also to drive out his followers who had taken possession of certain men and women. This was not a favorable sign! 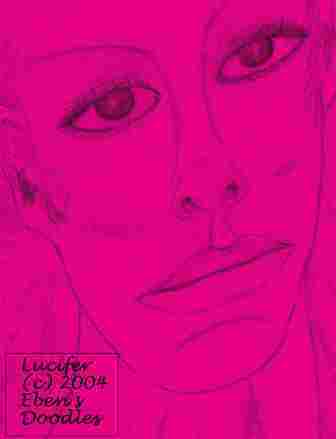 Lucifer redoubled his efforts to wipe out the God-fearers. If they kept repeating the word of God about the coming "Seed of Woman" who would set everybody free, and particularly the promise given in the garden that this Seed of Woman would someday come and destroy Lucifer’s rule and kingdom, then the evil would spread beyond his ability to check it. No, he had to stop the dangerous contagion at the roots! And, indeed, Lucifer was successful with nearly all. He soon had the whole world and its human community back under his control (as far as an essentially rebellious slave population could be controlled, that is!). Only a tiny fraction of pious, righteous-living God-fearers still survived despite Lucifer’s best efforts. With a little more concentration and hard work, that number too was greatly reduced. Finally, one God-fearer remained. His name was Noah. He was the son of Lamech, an old, bloody, vain reprobate who boasted to his two wives of killing young men who offended him.